Now you don’t have to leave your dog at home when you spend the day at Harbourfront Centre. Harbourfront Centre has added a new facility; a first of its kind, PawsWay is a Purina PetCare Legacy Project located in the heart of downtown Toronto at the exciting Harbourfront Centre. Besides enjoying the beautiful exhibits you and your dog can have a treat at Williams Coffee Pub which provides a dog friendly area for both of you. 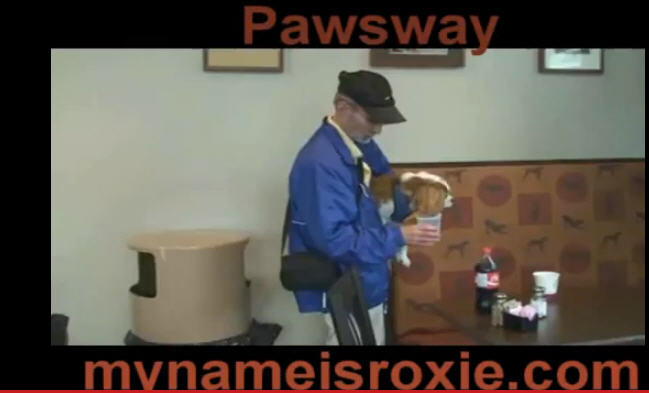 (See Roxie having a glass of water at Williams Coffee Pub in the above video “ROXIE AT THE PAWSWAY”). You will notice that Roxie isn’t sitting on the chairs – that isn’t allowed; and your dog can even do a little socializing at Pawsway’s 3,500-square–foot indoor Pet Park. If you feel like indulging your dog there is always the Paw Shop. Celebrate the joy of Pet Ownership, Explore the world of Pet Behaviour, Walk through the Purina Animal Hall of Fame which honours 142 heroic Canadian animals in a truly unforgettable exhibit; Take the Healthy Hug Test and take your dog to Pawsway’s indoor Pet Park at Pawsway’s unique waterfront location. General Admission is free and dogs are more than welcome as long as they follow Pawsway’s Canine Code of Behaviour. Pawsway’s indoor Pet Park have designated off leash times for small dogs and provide agility classes. Check Pet Park’s Calendar for events and classes. I had a wonderful time; met some great cavaliers, and even met up with my buddy Frankie. I think Frankie is very handsome; he’s a tri. At one o’clock everyone left PawsWay and went to a nearby park for a barbecue. My friend Frankie stayed until five o’clock and received a bunch of wonderful prizes. We couldn’t stay but the next event sponsor Brian Gray hosts we’ll make sure to stay for the entire day. Harbourfront Centre, on Toronto’s waterfront, is an innovative non profit cultural organization which creates events and activities of excellence that enliven, educate and entertain a diverse public. NOTE!!! Cats are only permitted to enter Pawsway when participating in dedicated cat events or programming. Dogs must be on a 6′ leash and retractable leashes aren’t allowed. A close eye must be kept on your dog at all times. If your dog has an accident you are expected to clean it immediately; and if need be you can ask the staff for assistance. No barking at the point of being rude.